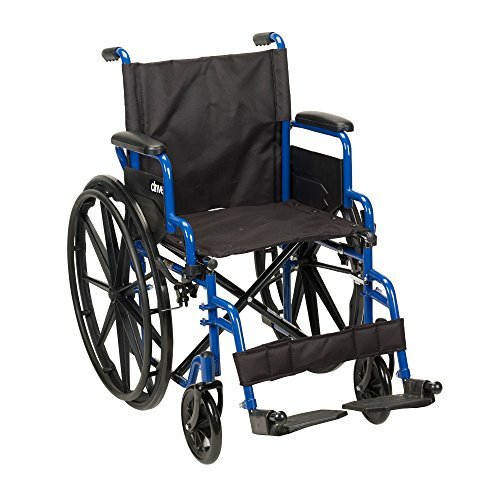 Drive Medical's Blue Streak Wheelchair features cutting-edge design with premium swing-away leg rests and detachable desk arms that flip back for advanced versatility and simple transportation. The 18" padded seat is ergonomically crafted for comfort to make independent mobility easy and enjoyable. The tires, made of solid rubber and mounted on composite wheels, ensure a consistently smooth ride, and feature push-to-lock functionality for extra safety. The sleek blue-powdered frame is finished with durable steel to resist cracks and chipping. The black cross brace and nylon seat upholstery are sturdy, lightweight and low-maintenance to clean.